Dial Forklift Scales fitted to a Hyundai Forklift were recently serviced by Accuweigh’s QWM Branch in Brisbane. 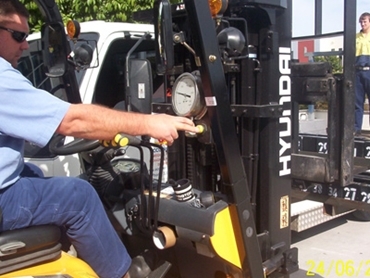 The Dial Forklift Scales were serviced, tested and calibrated to ensure correct weights for Hyundai Construction Equipment based in Ormeau QLD. Dial Forklift Scales use hydraulic pressure which is indicated to the operator using a large analogue dial gauge that has been calibrated to display weight readings on the forklift’s tines in 20kg divisions. This client’s Dial Forklift Scales are used use check weigh heavy boxes of machinery components as they are being loaded and unloaded at the Hyundai parts distribution centre. Accuweigh is Australia’s largest industrial weighing company and has branches in all mainland states providing after sales service and support on digital and Dial Forklift Scales fitted to front end loaders, excavators, trucks and trailers.